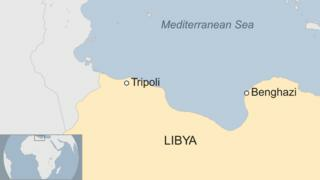 At least 27 people have been killed in two car bombs near a mosque in the Libyan city of Benghazi. Varying reports say 20 to 30 more were wounded by the blasts, which took place within minutes of each other. The first vehicle blew up in front of a mosque in the central al-Sleimani neighbourhood, as worshippers were leaving the building after evening prayers. A second car exploded soon afterwards on the other side of the street. Both military personnel and civilians are among the victims. The number of fatalities may rise, a spokeswoman for the local al-Jala hospital told AFP news agency. It is not yet clear who was behind the bloodshed. The BBC’s North Africa Correspondent Rana Jawad says many bombings of this kind go unclaimed in Libya.